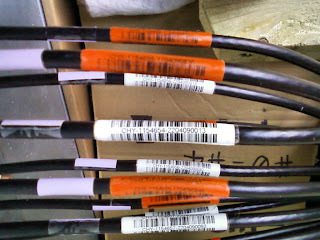 At the end of each signal cable, there is a barcoded label. This applies to the patch cables, the cables in the tiles and the long signal cables that go from the tiles back to the RF-container. Each cable within the system is carefully manufactured and the serial number on the cable contains information about its performance and role. For example, the one in the middle of this photograph (CHY-1154654-2204090013) is an 'C'able from the 'H'igh-Band Array, 'Y'-polarisation. It is '115' metres long and has a delay of '4654' tenths of a nanosecond. This means that, in laboratory conditions, it takes 465.4 nanoseconds for a signal to travel down this cable. What then follows is the date of manufacture (220409 = 22 April 2009) and the cable ID for that day (this one was number 13 for that day). All of this information can be scanned quickly with a barcode scanner. This then forms part of the site inventory, which means it is very easy to find certain parts in the event of a fault. Also, in order to make visual recognition easier, certain labels will be colour coded. For the array cables (of which the ones in the photograph are examples), the white labels are for the Y-polarisation and the orange labels are for the X-polarisation. This is why we colour coded the progress reports with orange and white!